If you are new to Doctor Who, here is everything you need to know about the show. The Doctor is an ~2,000-year-old alien Time Lord from the planet Gallifrey. 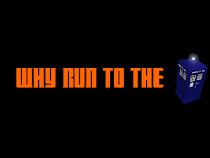 He travels through time and space in a machine known as a TARDIS (that stands for Time And Relative Dimension In Space). It can disappear in one spot, and reappear in another spot anywhere in the universe, at any point in time. It is supposed to be able to change shape to blend in, but due to a faulty chameleon circuit, it is stuck in the shape of 1960s police telephone box. It is much larger on the inside, due to the fact that it is dimensionally transcendental. That means that the inside is in a different dimension than the outside (basically a parallel universe). The Doctor is often accompanied on his travels by a companion, usually a young female. He carries a device called a sonic screwdriver, a sort of multifunction device, capable of things such as rewriting software, opening locks, blowing up stuff, and performing scans. A characteristic of the Time Lord race is that when they are close to death, they are able to regenerate in order to escape it. Regeneration basically rewrites their DNA and causes all the organs in their body to regrow accordingly. Various organs have to shut down in order to regenerate, which causes the Time Lord or Lady to be in a weakened state for several hours afterward. It also means they need two hearts in order to keep the blood flowing. As a result of the DNA being rewritten, they acquire a new physical appearance and personality (they keep the memories, but little else). The Doctor has regenerated 10 times so far, and is on his eleventh form. In the revived series of the show (2005 onwards), the Doctor is the last of the Time Lords. They perished in a war against a race known as the Daleks. The Doctor at first thought he was the only survivor, but later learned that the Daleks (his oldest enemies) also survived the war. It is eventually learned that the Doctor is the one who brought on the end of the Time War in order to avert the Time Lords destroying reality in order to save themselves. The Doctor has on occasion worked for an international military organization called UNIT. UNIT used to stand for United Nations Intelligence Taskforce, but the UN asked the BBC to change it, so it's now the UNified Intelligence Taskforce. It's basically a military group/intelligence agency charged with dealing with alien attacks and international security. Officially, the Doctor is one of their scientific advisers, but he hasn't shown up to work on a regular basis since his fourth regeneration (sometime in the early 1980s in their universe). Another anti–alien organization is the Torchwood Institute. They are limited to the New Series only (unlike UNIT which appeared often in the Classic Series). It was founded by Queen Victoria in 1879 to defend the British Empire from aliens (including the Doctor, who they viewed as the enemy). It is separate from the government and UN and is funded directly by the British crown. The Prime Minister is not technically supposed to know about it, and the Doctor was completely unaware of it, even after working for UNIT, who worked with Torchwood (even though they weren't supposed to know about Torchwood either). He didn't find out about it until the finale of Season 2 of the New Series, when it's main branch (Torchwood 1) fell. The spin–off series, Torchwood, follows the adventures of the members of Torchwood 3, headed by Captain Jack Harkness in Cardiff. If you're looking for a good episode to start with, the usual recommendation seems to be Blink. It's a very good episode, but the main characters are barely in it. A better standalone episode would probably be Planet of the Dead or Waters of Mars. If you do just start at the 2005 relaunch, there are a couple things to keep in mind. The first couple episodes aren't the greatest. The best episodes of season one are towards the end, so stick through the entire season before forming any strong opinions (it's only thirteen episodes). Second, after Voyage of the Damned, stop and watch the first two seasons each of The Sarah Jane Adventures and Torchwood spin-offs. This is because the spin-offs crossover in the 2008 finale. When you watch the classic series, be advised that in 1970, the BBC's warehouse ran out of space, so they simply began recording over stuff. As a result, there are over 90 episodes from the sixties that simply no longer exist. You may happen across them on the internet, but the video has been replaced with either animation or a series of screenshots (the audio was preserved for all of them). Also, much of the classic series is difficult to find legal copies of except on DVD. Which season is The Eleventh Hour? I don't see it on the Doctor Who Schedule.